In this week’s WednesdayWorkout we are looking at one of Hollywood’s biggest stars, Orlando Bloom. The Pirates of the Caribbean actor has revealed how he maintains his amazing physique – taking inspiration from his celebrity friends! 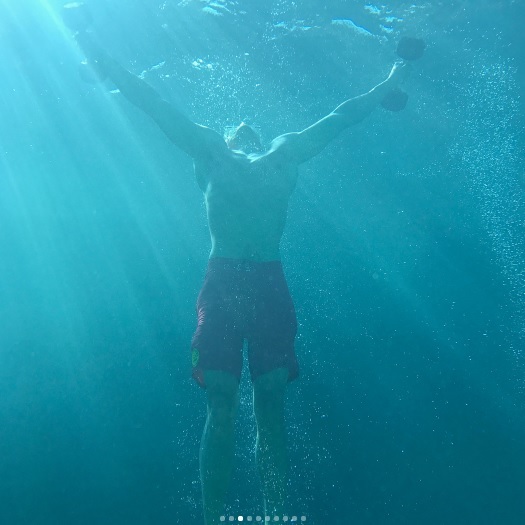 Bloom performs these in circuits, however, after being introduced by his friend and American big-wave surfer, Laird Hamilton, the actor alternates this workout with another unique training method – ‘Aqua Training’. Submerge the plate in the water and push it away from your chest. It gives your upper body a good workout because the water creates more resistance on the plate making the exercise harder than on dry-land. This is simply swimming across the pool with a dumbbell in one arm. Orlando does this for as long as he can with one breath of air. Working your abs and core. push plate rotations consist of rotating your torso from side to side pulling and pushing the plate through the water. Stand flat on the bottom of the pool, with a weight squat and then push up with the weights to the surface of the pool. Orlando will walk across the bottom of the pool (completely underwater) with dumbbells in both arms. As well as working his arms and upper body, this will work his legs due to the resistance of the water. Trained by Laird himself, Bloom is used to Aqua training and has built up his ability to complete the exercises in the water. If you are going to try this make sure you don’t strain yourself – work your way up to this level to avoid injury or danger. Bloom has been in good shape for some years – maintaining this has been through hard work, dedication and workouts like the one’s above!